"Whether you are looking for obedience training or behavior modification, we have the education, experience and ability to ensure success." Empire K-9 is a Professional Dog Training Company that specializes in Boot Camp for Dogs, Puppy Training Camp, Dog Boarding and Obedience, Deaf Dog Training and Pet Dog Behavior Modification. We work with all breeds and temperaments and have a proven history of successfully modifying behaviors such as biting, jumping, aggression, and separation anxiety. Our Boarding and Training approach allows us to take a dog through the various Stages of Training and provide our clients with an efficient and effective approach to dog training. 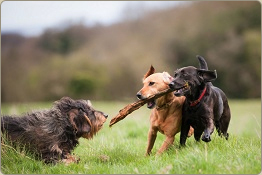 By taking your dog on off-site training trips we train your dog and modify problematic behaviors so you don’t have to! Both our Puppy Training Camp and Boot Camp for Dogs programs allow us to teach obedience commands which are used to navigate various life situations with your canine companion, successful Pet Dog Behavior Modification, instill basic manners/ etiquette so your dog acts appropriate, and help create a balanced companion through off-site training trips. In addition to general training and behavior modification we also offer specialized training for Deaf dogs. We are one of only a handful of companies in the country that specialize in training Deaf dogs. Our Deaf dog training program allows us to bridge this unique communication gap and allow us to lay a solid foundation reducing stress of both owner and canine. Your expectations are our goals. With the average life span of a dog being 12.8 years it’s important to bridge the communication gap and successfully integrate your canine companion(s) into your home so you can enjoy those years rather than survive them. No matter the age, breed, or temperament of your canine companion we can get the results you need in one of our Dog Boarding and Training programs. If our Boot Camp for Dogs programs or Puppy Camps don’t provide exactly what you need we can customize a course that will. Whether you need obedience training, pet dog behavior modification or dog boarding and training, let Empire K-9 be your first and last stop for all your dog training and behavior modification needs. On behalf of Empire K-9, Inc. thank you for visiting our site and feel free to contact us anytime!